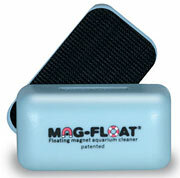 The Mag-Float's powerful rear earth neodymium magnets enable the easy removal of algae. 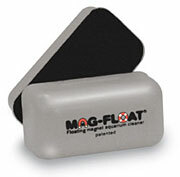 By dragging the Mag-Float on the outside of the tank, the Mag-Float on the other side of the glass/acrylic surface follows, scraping off the algae with the pad. Most impressively, you will no longer get wet cleaning off the algae from your aquarium. It will simply float up allowing easy retrieval. Therefore, its unique floating feature allows easy and efficient movement around the corners of fish tanks, and you will no longer knock over decorations, damage corals and invertebrates. The cleaning velcro pad remains free of sand or gravel, thus preventing scratching. The ABS plastic, injected molded and toxic free, allows the Mag-Float to be left attached to your aquarium surface at all times. This makes it convenient and practical for the next cleanup job.